Finger plays have been used in early childhood classrooms for many years- however, they seem to have taken a backseat recently to more “academic” skills. Did you know that fingerplays have many educational benefits that can help support the development of skills necessary for meeting Common Core Standards in Kindergarten? Experts recommend that children with difficulty learning to read go back and learn rhymes and finger plays because they are the building blocks of reading success. 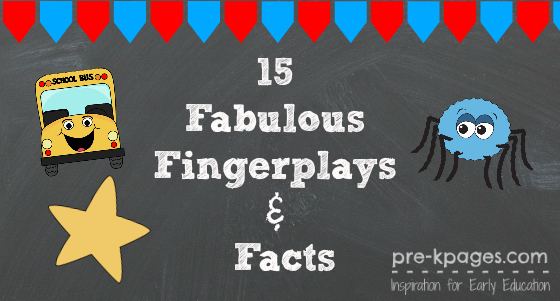 Today I’m joining Deborah of Teach Preschool and Karen of Prekinders to bring you 15 Fabulous Fingerplays and Facts. 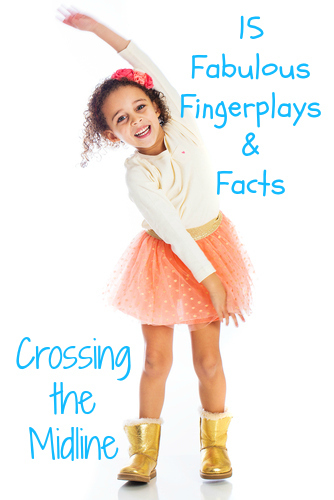 We have each chosen 5 fingerplays and facts to share with you so make sure to stop by each blog to get the full list. I have included YouTube videos below simply to illustrate the rhymes for those of you who may be unfamiliar with them; I am in no way advocating that videos replace the teacher and hand motions. Crossing the midline is any movement in which the arms and/or legs cross over the center of the body from one side to the other- thus making the left side of the brain work together with the right side of the brain. Crossing the midline is crucial to the development of skills such as reading and writing which require the hand and eye to cross the page as text is read or written. Research shows that children who are unable to cross the midline are often not developmentally ready to read. One very popular fingerplay that can support crossing the midline is Twinkle, Twinkle Little Star. When I introduce the rhyme I encourage the children to move their arms and hands across their body as if they are reaching for the stars one at a time with each hand. For example, the left arm and hand cross the body as we sing the first “twinkle” and the right arm and hand cross the body in the opposite direction as we sing the second “twinkle.” We continue on in this manner as we sing the song to get lots of crossing the midline practice from day one! Whenever possible I try to have a book or flannel story to go along with the fingerplays we sing in class. After introducing the fingerplay and singing it several times with the class I then introduce the book and invite the children to sing along as I read. After this introduction, I place the book in our classroom library and it creates a natural motivation to read. Young children feel successful and confident “reading” books that are familiar to them. Self-regulation is the ability to control impulses and wait for a turn. Could your child or students use a little help developing self-regulation skills? Good news! Any song that starts slowly and gradually increases in speed will help children regulate their behavior. They must listen and participate in the song as the speed increases- thus building their anticipation and causing them to wait and regulate their own behavior as the speed increases. One of my favorite fingerplays that supports the development of self-regulation skills is Ram Sam Sam. Of course, the first time you sing Ram Sam Sam with your class they won’t know that the speed is going to increase; after you sing it together a few times they will squeal with delight each time they participate in this fun chant. The video below is just for example, but no music is actually necessary. I have been using Ram Sam Sam as a chant in my classroom for years without accompaniment and it’s just as fun. Using fingerplays offers the learner opportunities to develop oral language skills in a fun and playful manner. The sing-song chants aid in retention of vocabulary and provide a safe way for a child who is learning a second language or perhaps just shy to develop oral language in a supportive environment. One fingerplay that provides lots of oral language support and vocabulary development is Sticky Bubble Gum. This is another fingerplay that has them engaged and begging for more from day one. Transitions can be tough with little ones, often they need guidance and re-direction to help them focus. Another of my favorites is The Grand Old Duke of York. This one helps them get their wiggles out and can also be done in a similar fashion to Ram Sam Sam by increasing the speed each time to support development of self-regulation skills. Singing it just once can be a great way to help make transitions go smoothly. No fingerplay list would be complete without The Wheels on the Bus! 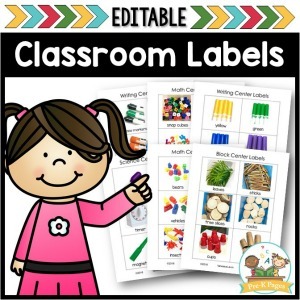 This classic is a sure hit with any preschool or kindergarten child. When you need to gain children’s attention just start singing this song with all the hand motions and soon everybody will be joining in. The rhythmic chant and movements are very engaging for young children. One of the questions I receive most often from readers is how to manage students during whole group time; I believe fingerplays are the answer. You don’t need to search for any particular song on a CD or iPod, you just start singing and making the motions and they will magically follow along. There are other actions you can add to Wheels on the Bus so you can make the song as long or as short as you need to. The Wheels on the Bus is also available as a book by many authors so I would do the same as I did with Twinkle, Twinkle Little Star and read the book aloud to the class then place it in my classroom library. Don’t forget to stop by Teach Preschool and Prekinders to read the other ten Fabulous Fingerplays and Facts! Thank you for sharing! I can’t wait to show my kiddos “Ram Sam Sam” and “Sticky Bubble Gum”. They are both new to me. 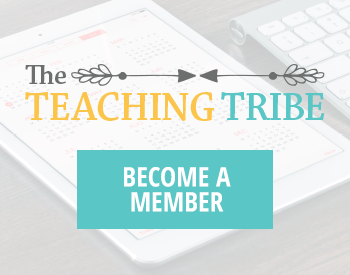 emails and seeing what awesome new tricks you have up your sleeve. Thank you so much for sharing. 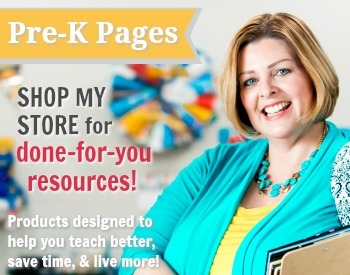 I have been teaching preschool for 4 years now and love exploring new ideas! Thanks for stopping by Paula, I’m so glad you like Ram Sam Sam and Sticky Bubble Gum! I love the RAM SAM SAM sing and play. Can you send me the words, please? I’m working as an early literacy specialist providing interactive programming for kids 2 – 4 and their parents/caregivers. This would be a big hit! Thank you for your explanations of why we do a particular song or rhyme. 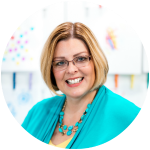 I always feel like I am fumbling around with sharing tips to parents and caregivers. So glad you found the explanations useful Vicki. I’m thrilled that librarians are part of our audience here at Pre-K Pages, I have a great affinity for libraries and librarians. The most important thing parents should know about fingerplays is that watching a song, chant or rhyme on a mobile device is never a substitute for the real thing and will not be anywhere near as helpful to their child as singing and doing them with their child. Vanessa, I just began a music & movement program at the library this fall called Jumpin’ & Jammin’ for 1-5 year olds. I am hoping to teach parents and adult caregivers that you can and should get up and move with your children. We have a nice collection of music CD’s for children at our small rural library. It has been a great success in the 2 weeks I have offered it. I know I will be including a few of your song & movement suggestions as I occasionally swap out the songs & rhymes. Public libraries are very aware of getting children ready to read and ready for school in the programs they offer. This is a great collection! I’ll have to use this in my preschool class. 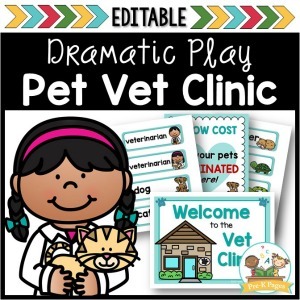 I’d love for you to come share this at our Pinning for Play link party!